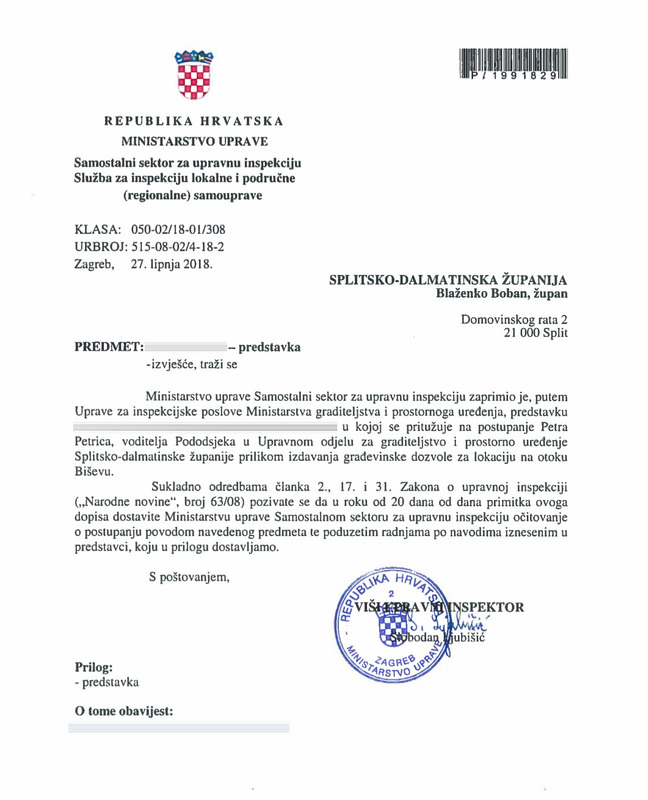 On Nov 9th 2017 we reported illegal construction to the construction inspection in Split. 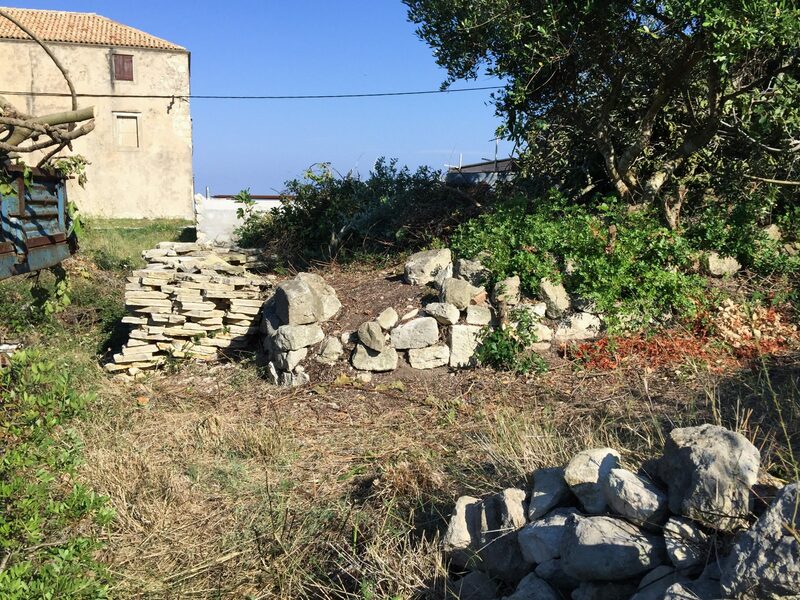 Illegal construction and excavation at this site have a negative impact on the church and the potential archaeological site, so it is decided to carry out preventive protection on the surrounding parts while no monumental features are found in the mentioned coverage. 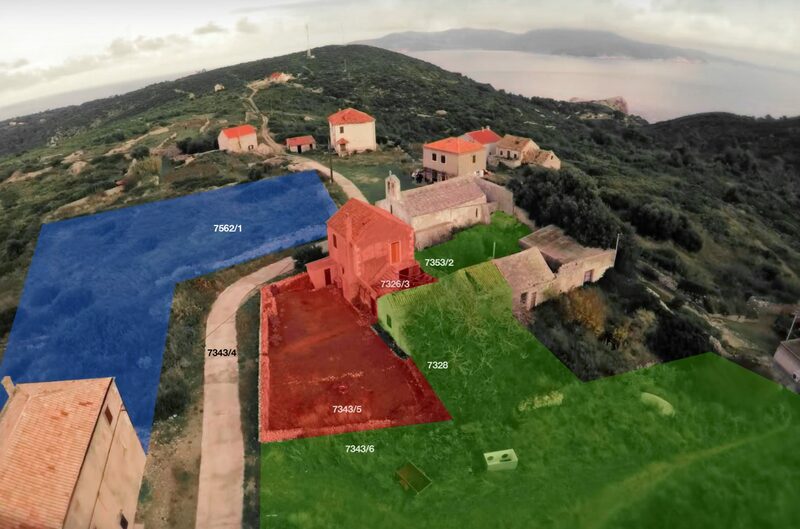 This would stop further devastation and allow the future presentation of the remains of the Benedictine monastery if they were found. 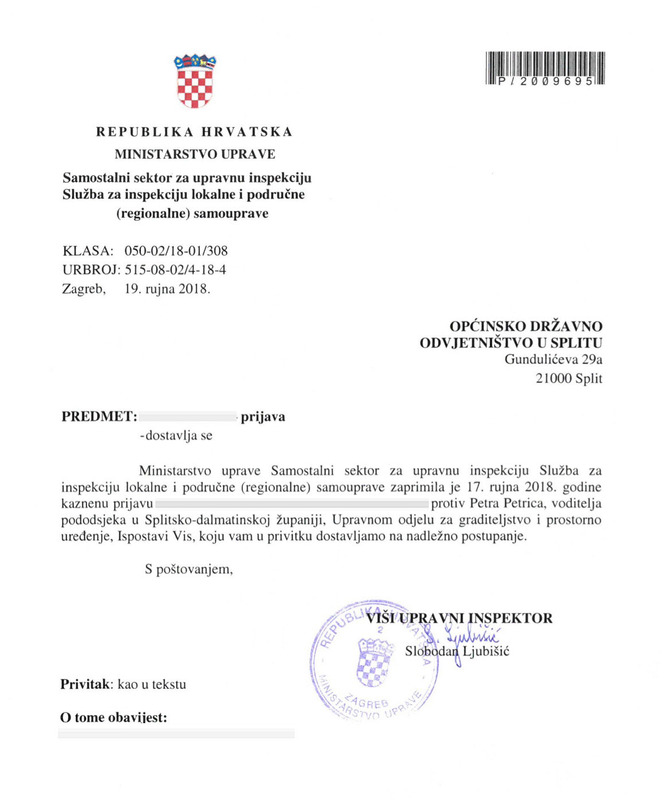 Taking into account the data from the historical sources and the complexity of the position, the Ministry of Culture, the Conservation Department of Split, as the competent body, will conduct a review of the cultural property solution in order to establish the scope of the archaeological site, the protection measures and the possibility of presenting the remains of the Benedictine monastery his remains . 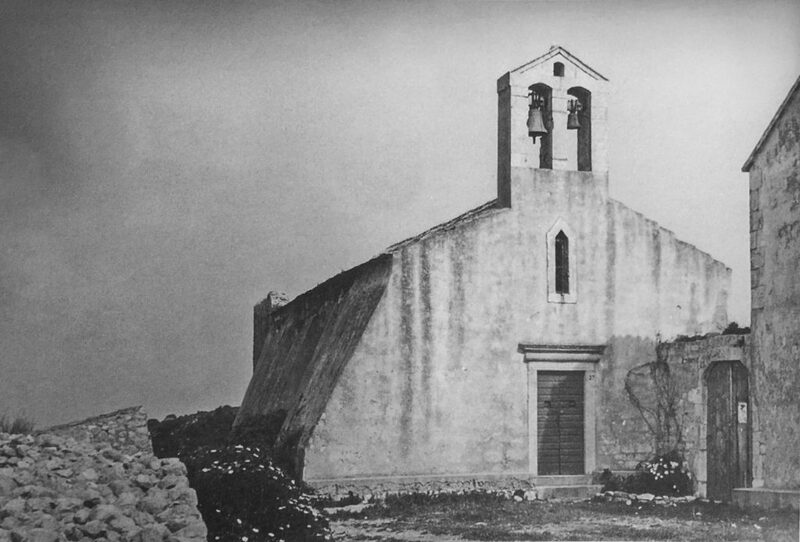 Research on a wider area, including a construction site in the immediate surroundings of the church of St. Silvestra, should establish the position of a monastery house and a small Benedictine cenobia, so that the conditions for presenting archeological remains outside the church could be obtained. 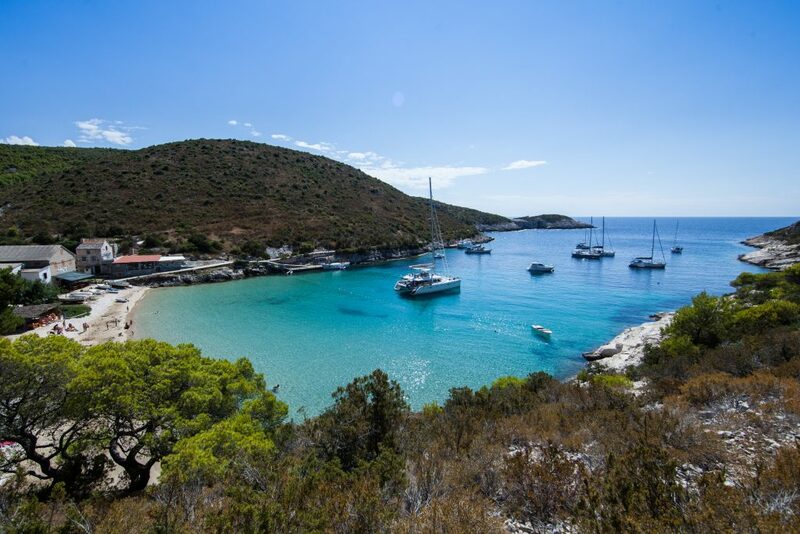 Considering the natural and cultural values ​​of the whole area of ​​the island Biševo, which together represent the exceptional ambience and authentic landscape of the Adriatic Adriatic Sea, we consider it necessary to preserve these values ​​to the fullest extent possible. 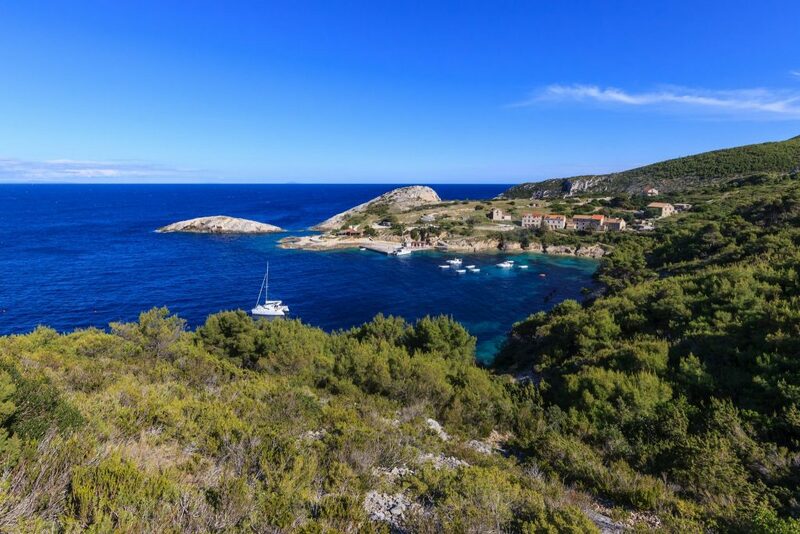 However, the competences and conservation mechanisms go beyond the conservative approach and other protection mechanisms (Natura 2000 Ecological Network Area, Geopark Viški Archipelago) have to be activated, which will influence the quality planning and management of island values. THE HOUSE OF THE INVESTOR PJERINA IVČEVIĆ (LEFT) AND THE NEIGHBORING HOUSE OF THE TORRE / TAFRA FAMILY (CCA 45M2 ), FOR WHICH IVČEVIĆ OFFERED 4000 EUROS. 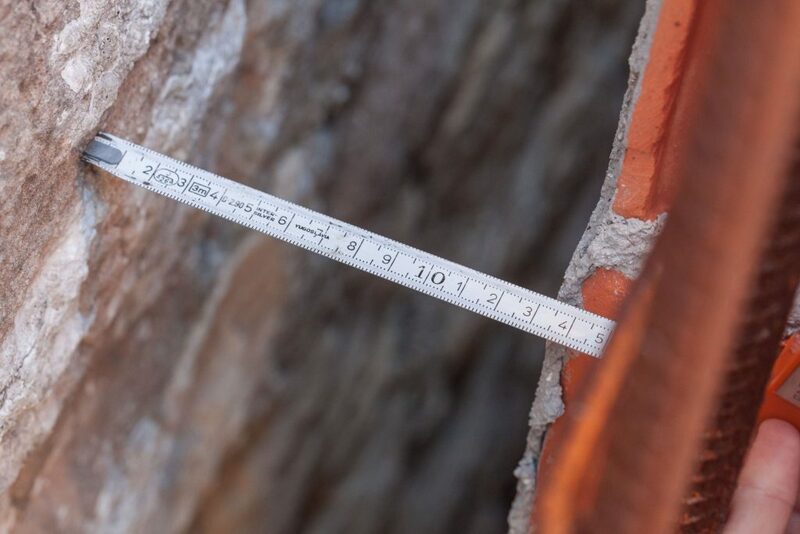 The construction site is not marked according to the Ordinance on the content and layout of the slab marked by the construction site (NN 42/14). 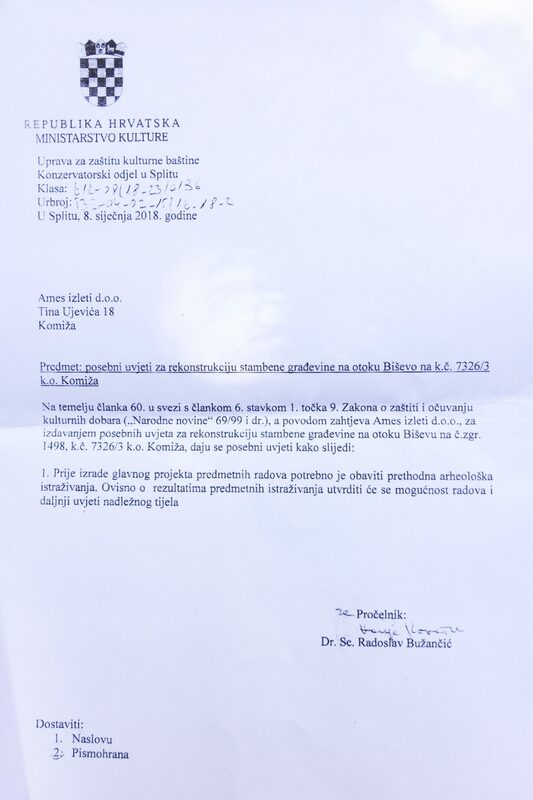 Although it can not be determined on the basis of which it is being built, it is certain that the construction work (NN 153/13, 20/17) should be done, that is, that the owner should obtain the building permit (Articles 106-120 ). 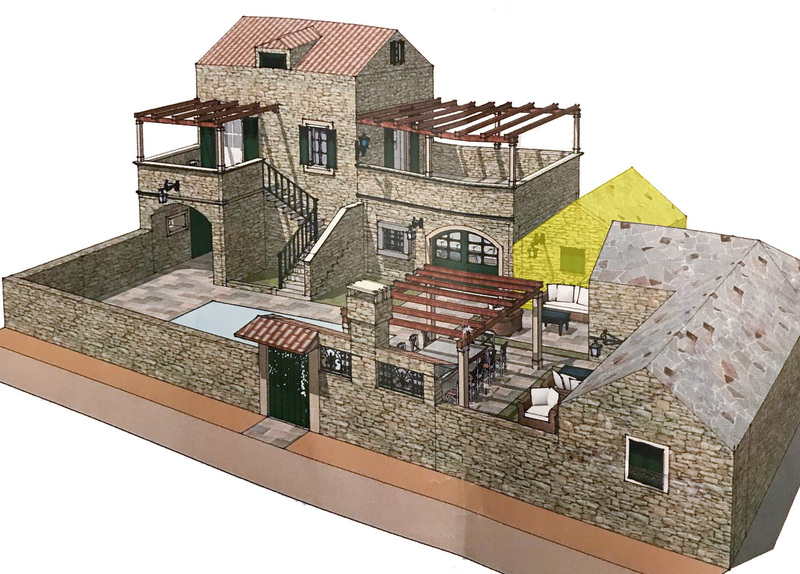 Namely, it is partly a reconstruction of a building built before 15 February 1968, and partly on the upgrades and new buildings as is clear from the photo of the construction site attached. 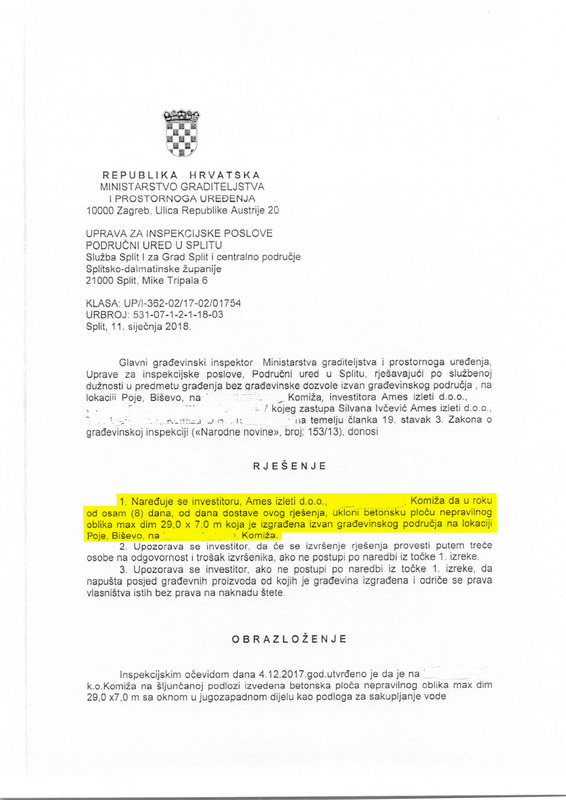 Building Plots are included in the Spatial Planning Plan of the City of Komiža (Official Gazette of the City of Komiža, No. 10/06, 2/15). 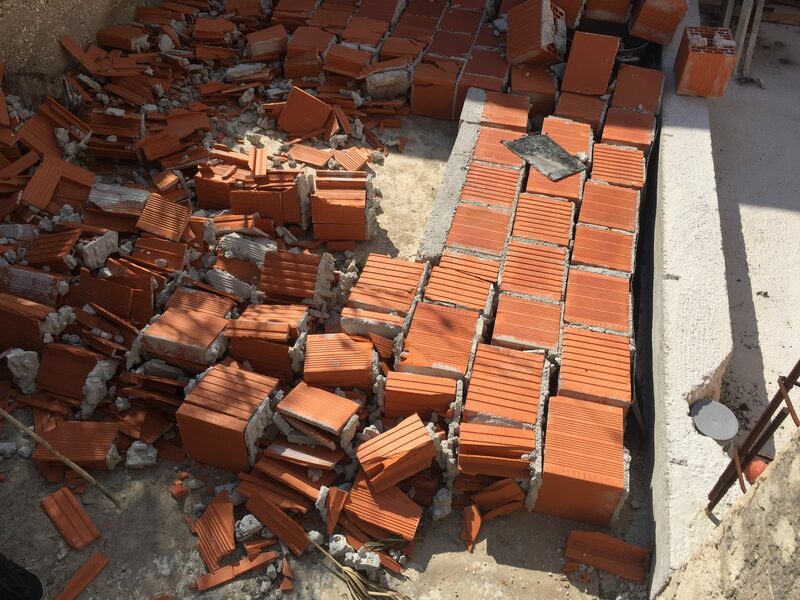 THE DEVASTATION OF A PART OF THE DRYWALL, TAMPONIZATION AND CONCRETEIZATION OF APPROXIMATELY 850M2 OF LAND UNDER THE PROTECTION OF NATURA 2000 (MEASURED AT HTTP://GEOPORTAL.DGU.HR ). 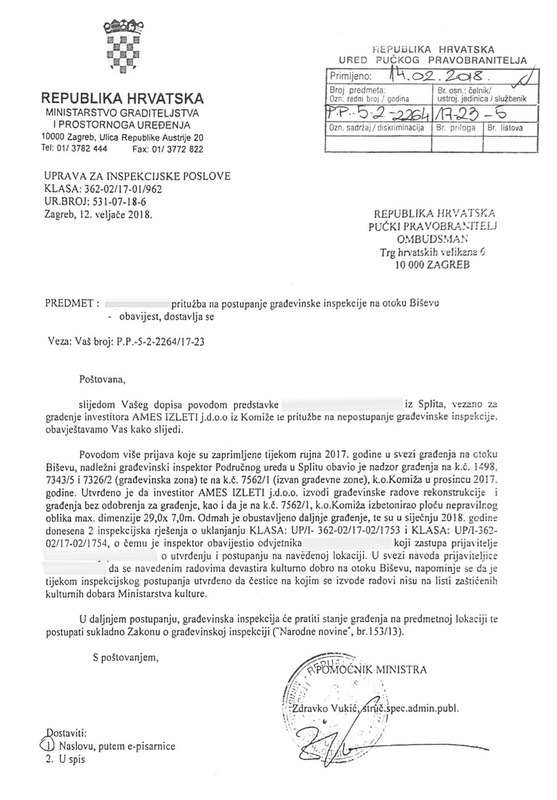 IVČEVIĆ IS NOT THE OWNER OF THE PLOT 7562/1. 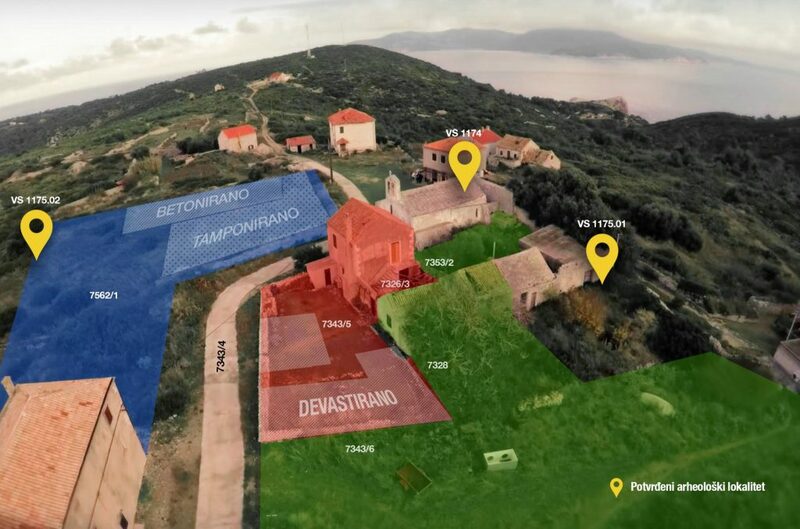 According to the cartography “Conditions for use, arrangement and protection of the area – areas of special conditions of use”, the particles are in the archaeological area . 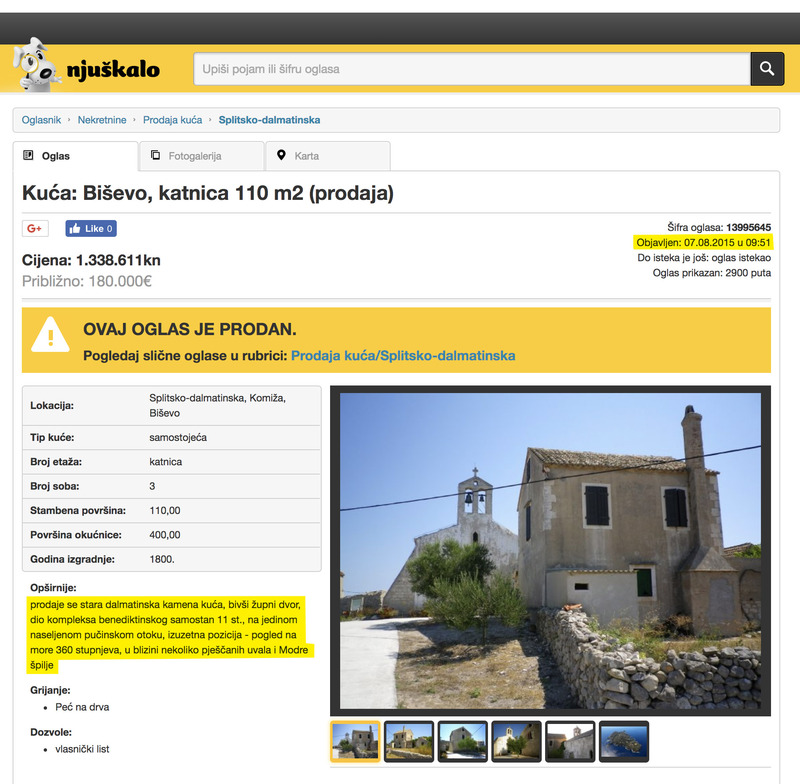 Additionally, there is a contact zone of the church of St. Silvestra is registered in the Register of Cultural Property of Croatia . 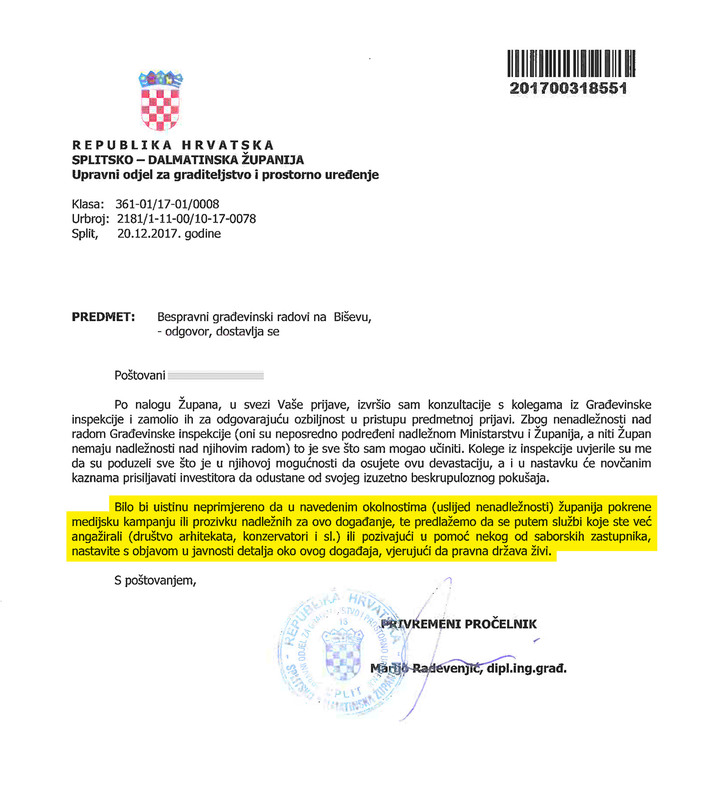 In other words, the minimum required was the confirmation of the main project of the competent public authority. 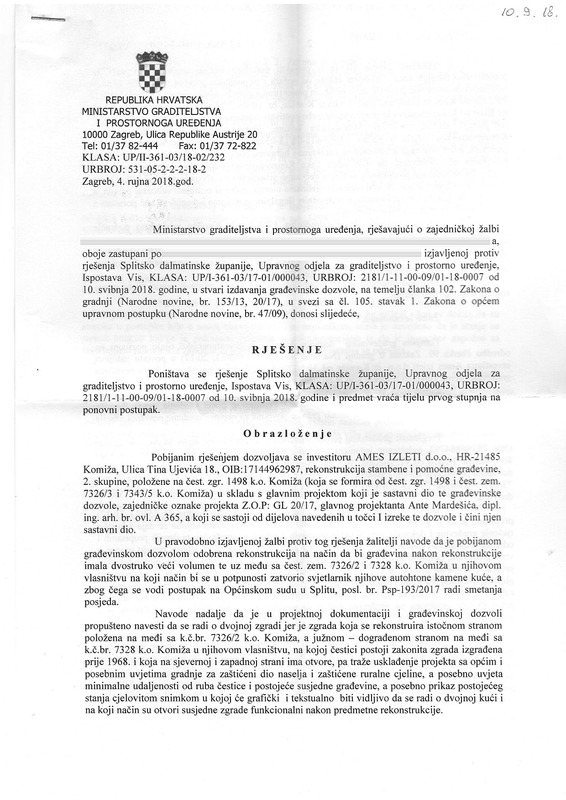 Bearing in mind the delicate context, the fact that at the time of earthing works (which were in the main) required at least archeological supervision, the owner of the particle was in violation of the Law on Protection and Conservation of Cultural Property (OG 69/99, 151/03, 157/03, 100/04, 87/09, 88/10, 61/11, 25/12, 136/12, 157/13, 152/14, 98/15, 44/17). 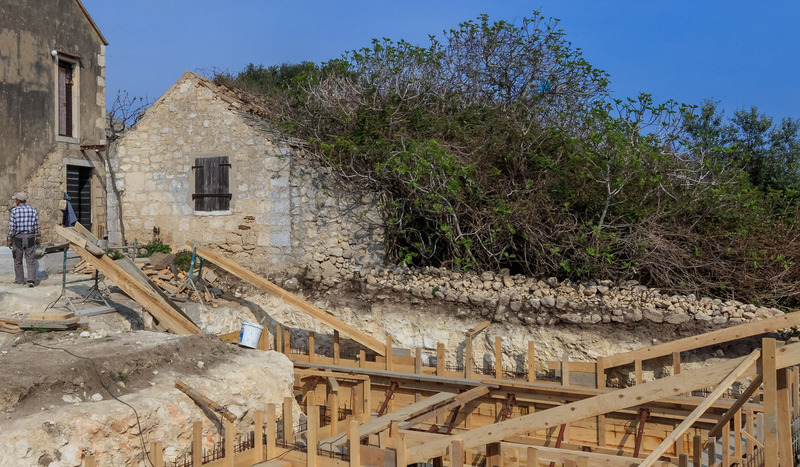 Up to now, the unlawfully built part is separated from the existing building, which is in line with the provisions of the PPUG of Komiza , in particular the conditions of Article 31 relating to the construction conditions in the constructed contact area. 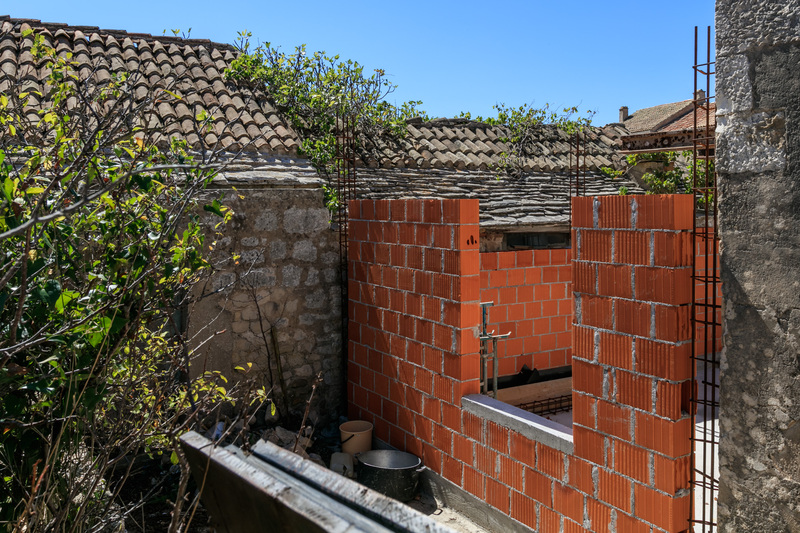 It is not in line with the distance of the objects from the particle boundaries and the planar size, which means that no such building permit can be obtained for such a conceived assembly . Part of the existing building has been removed, and some openings are built. 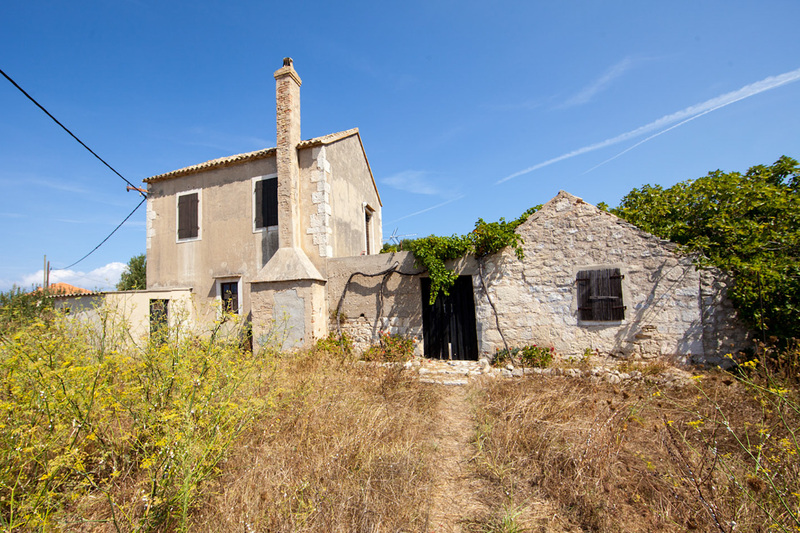 Removal required clearance for removal, and the change of openings on traditional buildings is not allowed in principle. 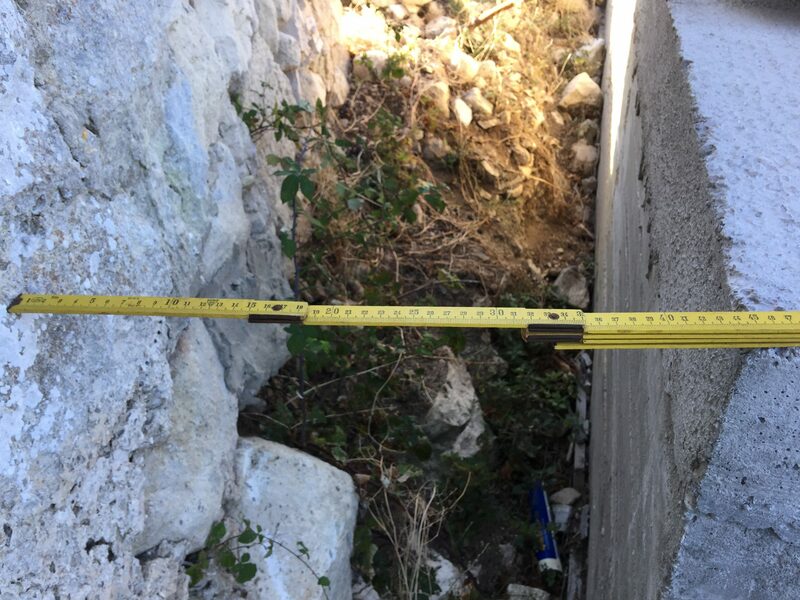 The fact that the construction site does not have a protective fence is particularly dangerous and affects the safety of the site, and excavates a minimum of 3 meters deep and a part of the excavation is located directly on the road. 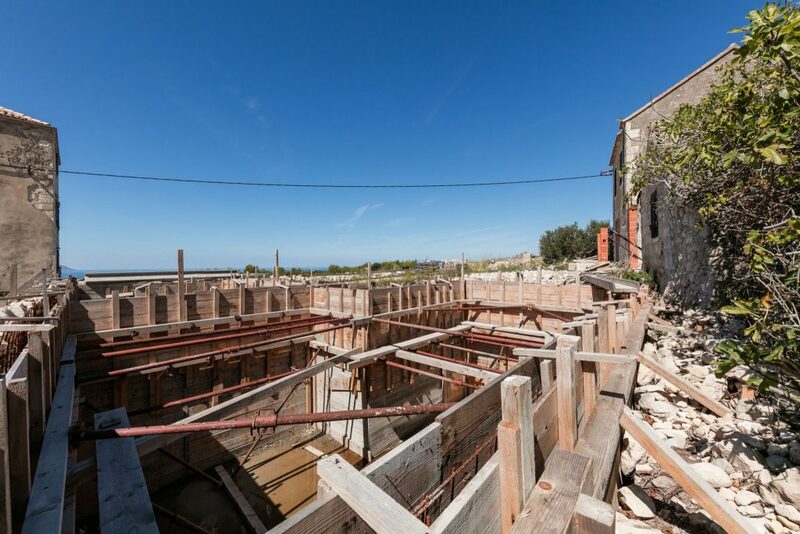 Excavations and rough construction works in one part are located next to the neighboring built particle and there is also the possibility of material damage. 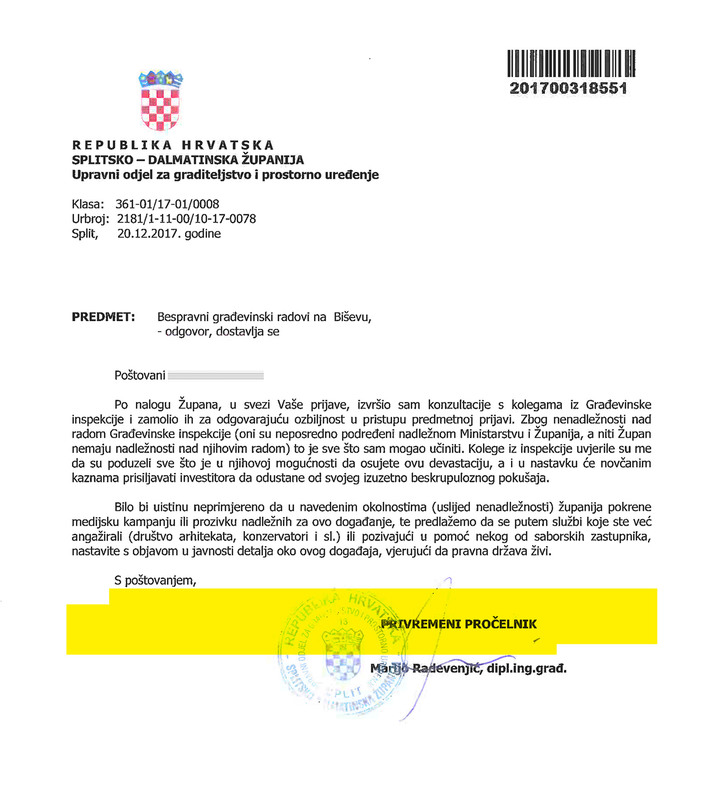 In addition, the pledge has been entered in the ownership list to secure the claim by the Croatian Bank for Reconstruction and Development (HBOR). 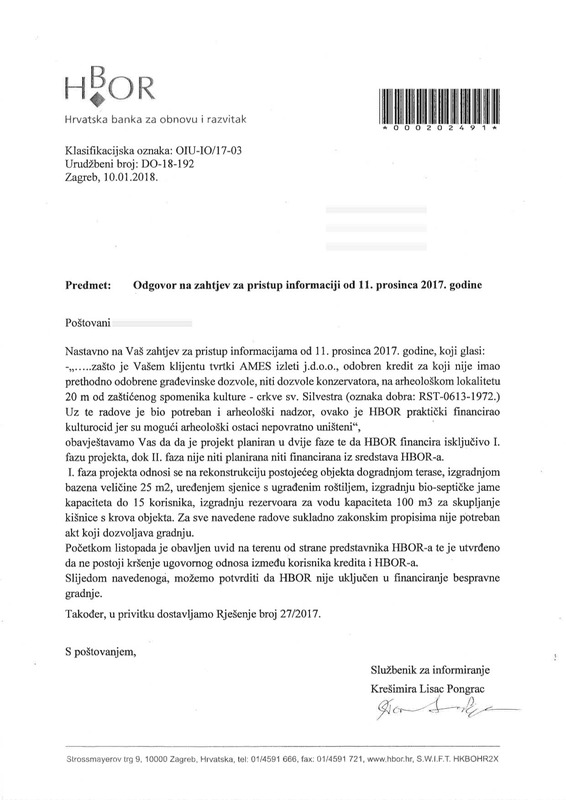 Since it is customary to approve loans for legitimate construction, then HBOR’s credit is spent on illegal activities . 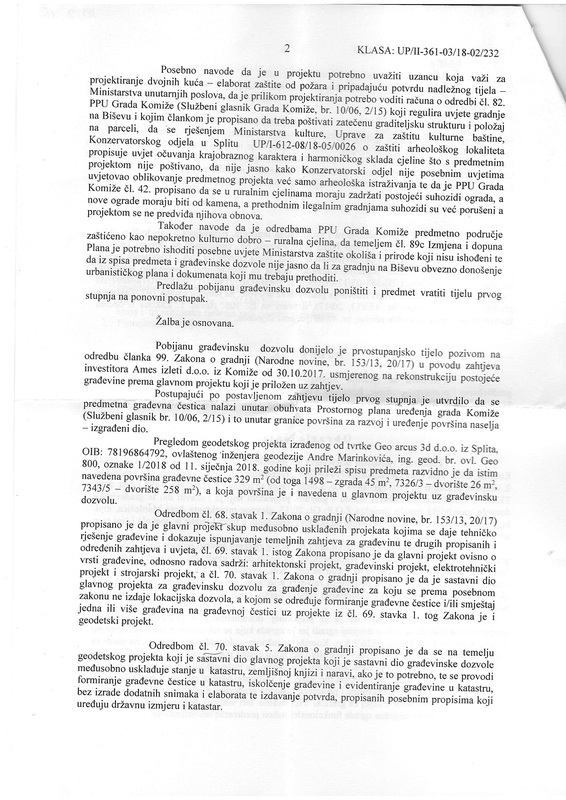 The competent authorities are required to act in accordance with the criminal provisions of the relevant laws. Although from HBOR claim that for all the above mentioned works there is no need for an act permitting construction, from the County we received exactly the opposite answer. 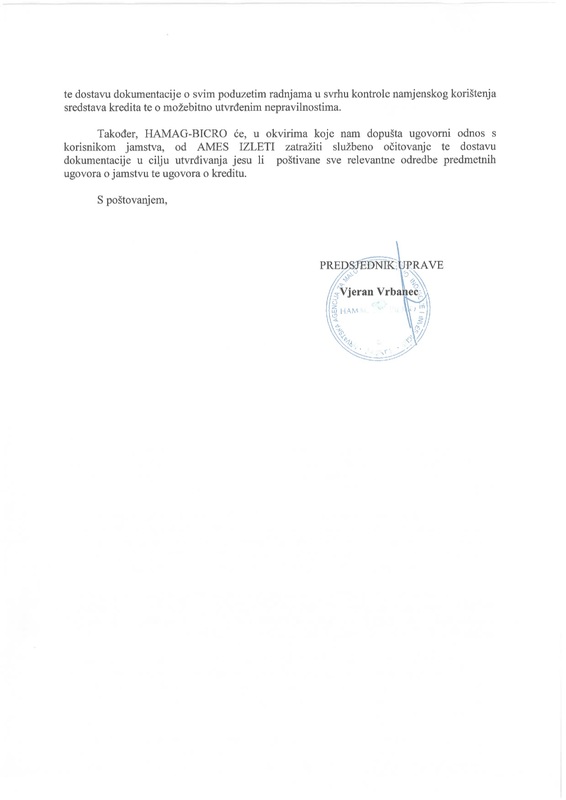 The Administrative Department for the Construction and Spatial Planning of the Split-Dalmatia County provides evidence that for the planned activities (reconstruction and expansion of the existing building, construction of the lower part of the building, construction of a water reservoir construction of a wall, etc.) 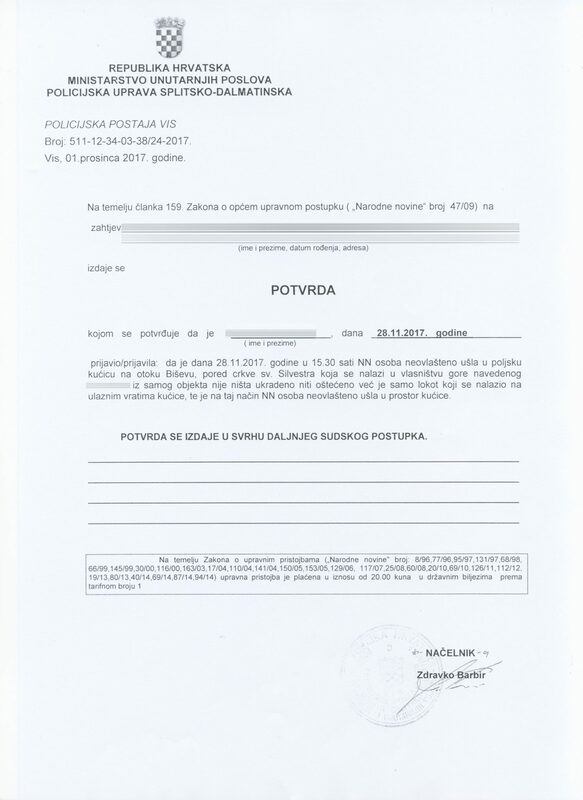 it is undoubtedly necessary to obtain a building permit based on the main project . Without a building permit Mr. Pjerino Ivčević started construction of the building in the yard of the family house at the beginning of 2017, 1498, Plot 7326/3 and Plot 7343/5 in Komiža (owned by AMES EXCURSIONS jdoo . 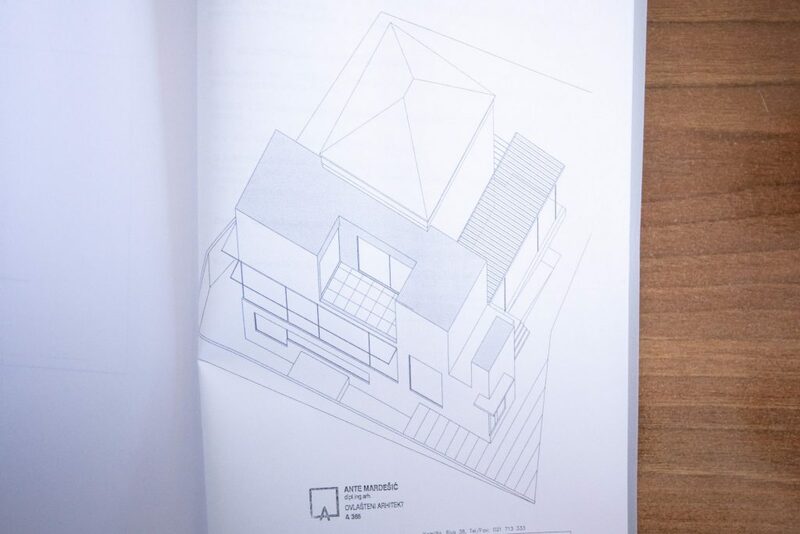 ), And without the consent of the neighbors directly relied on the construction of only 14 cm from the neighbouring house on Plot 7328, 7326/1 and 7326/2, closing the small window on the north side. 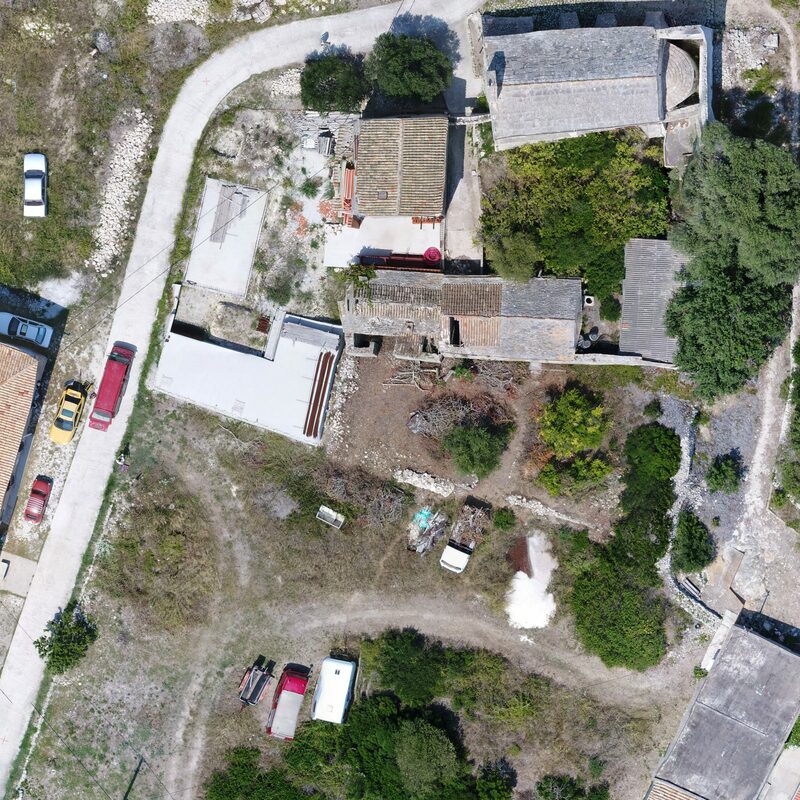 It seems he is trying to build a two-storey building with two other buildings directly on the cadastral plot boundary . 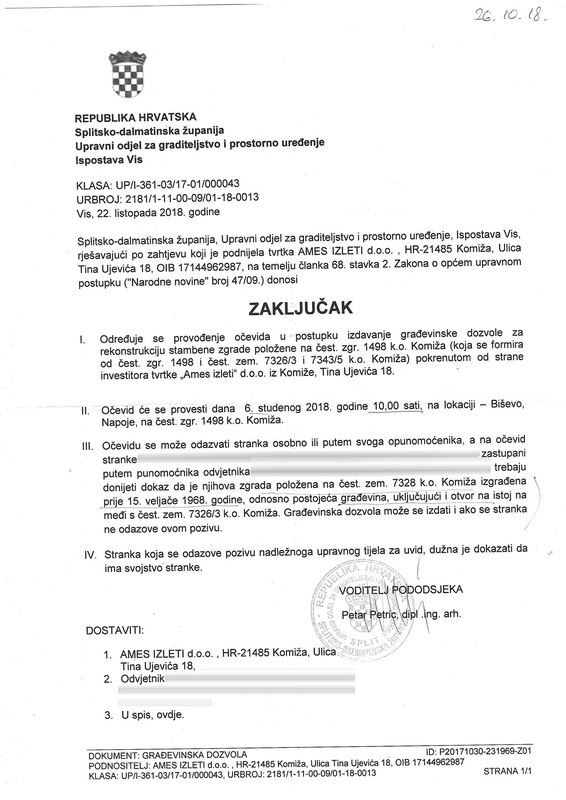 The investor expands his land plot. 7343/5 more than 1.5m on the public road 7343/4 and thus prevent the passage of fire-fighting vehicles in case of fire. 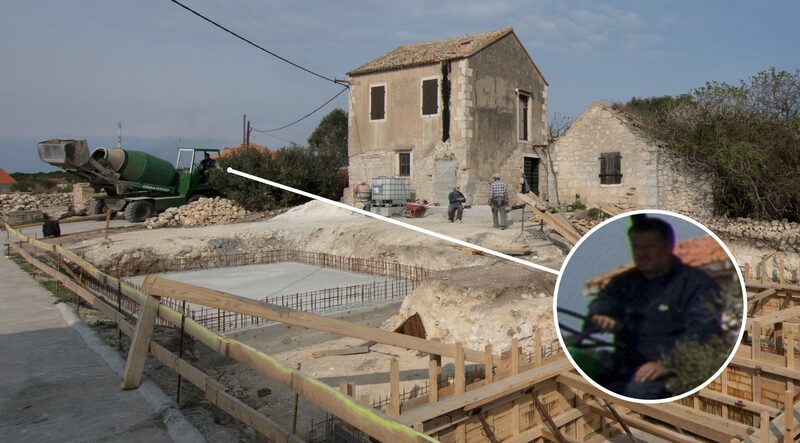 An investor outside this construction site at a distance of 40 meters from the church (number 7562/1 in Komiža), without the building permit and the approval of the owner, Mr. Neven Karlovac tampons and concretes about 500m2. 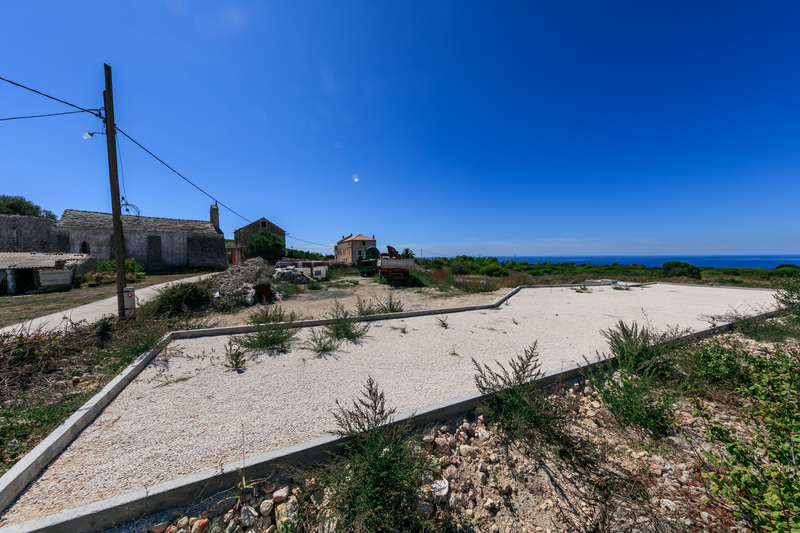 These works grossly violate the archeological site of the monastery of St. Silvestra and the entire landscape of the village Poje (visible from the attached photograph). 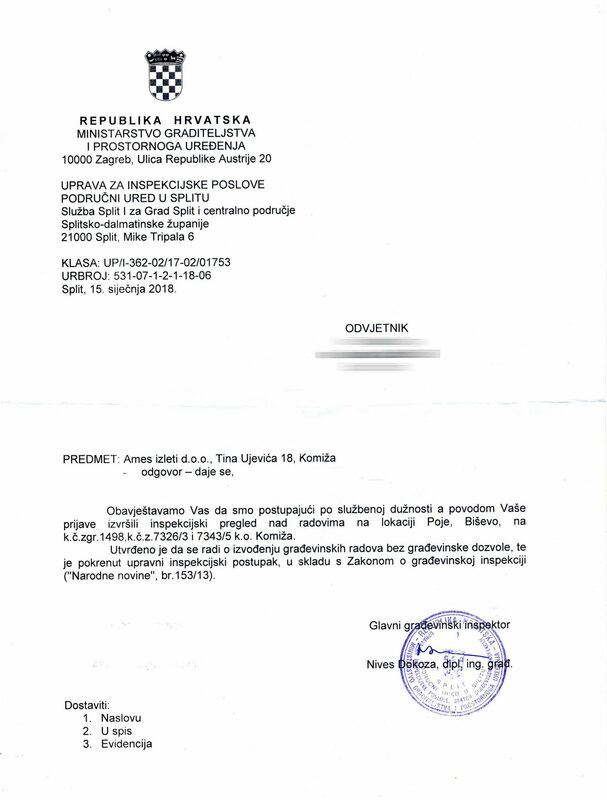 Pjerino Ivčević is the husband of the owner of the company AMES IZLETI jdoo, and the first cousin of the Mayor of Komiža, Tonka Ivčević. On the basis of the above mentioned quotations, an examination was carried out which determined that they were at cC. 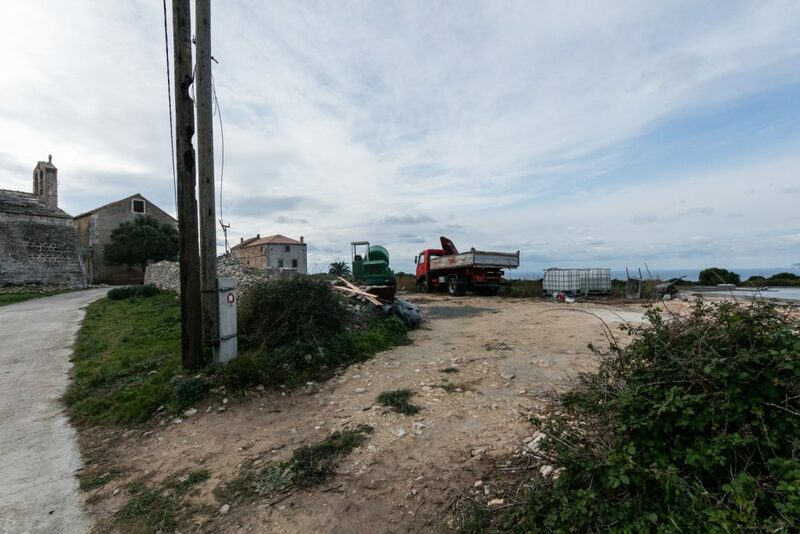 7343/5 excavation works, construction of concrete foundations and construction of water tank. 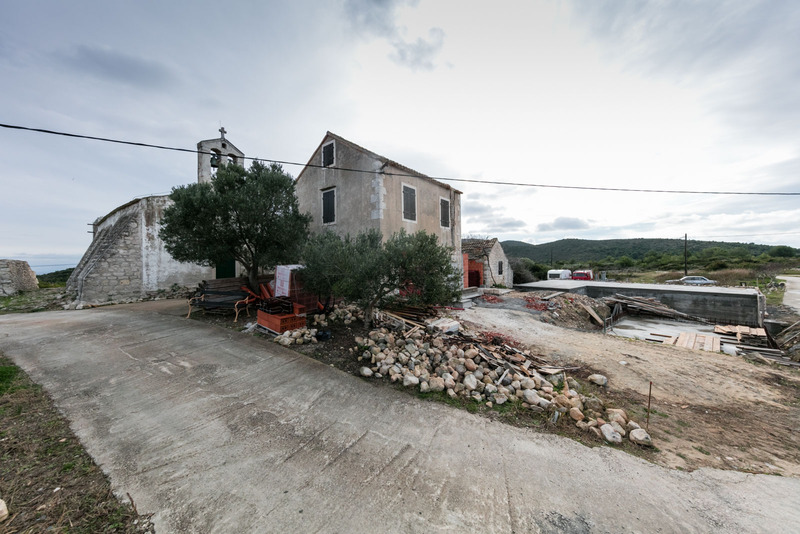 The subject matter lies outside the scope of protection of the cultural property – the church of St. Silvestra (RST-0613-1972). In the visible part of the profile of the excavations excavated no remains of architecture or the cultural layer. Several fragments of late antique ceramics have been found . At cp. 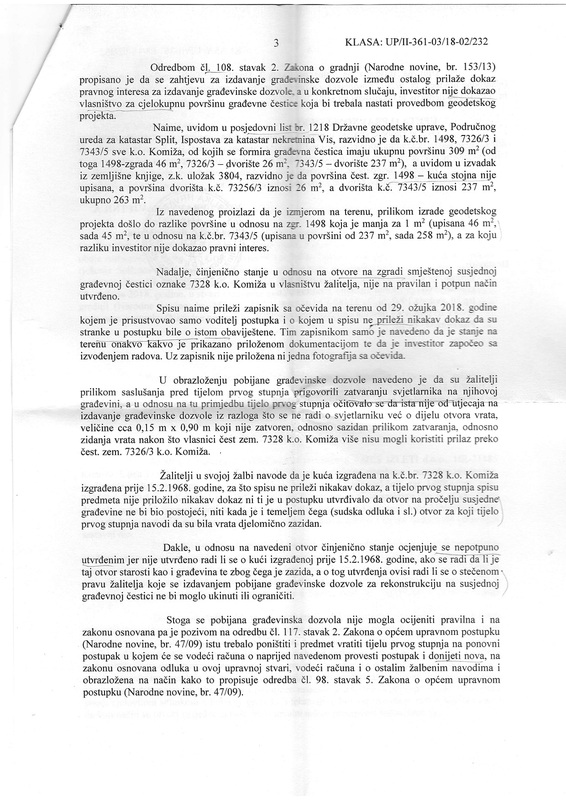 7562/1 (the particle is located outside the protection zone of the church of St. Silvestra) opposite the cp. 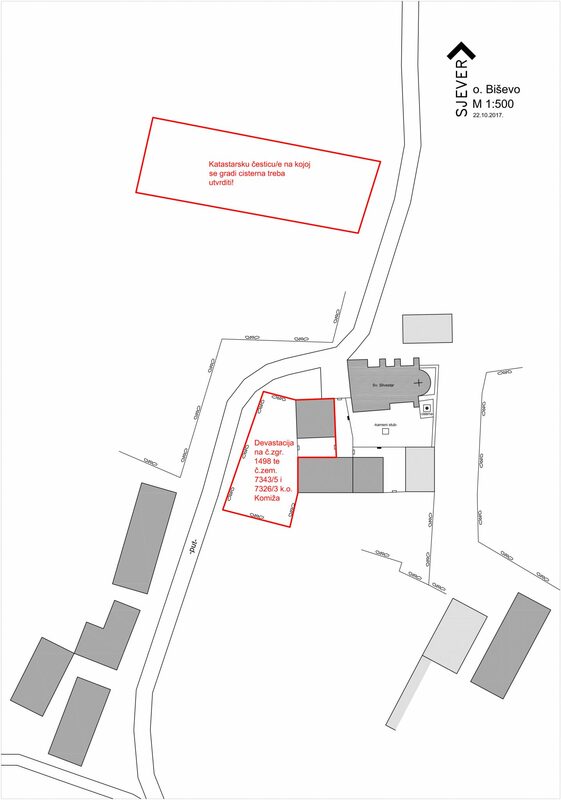 7343/5 was carried out an overview of the embankment which may have been generated by land dumping from excavation. 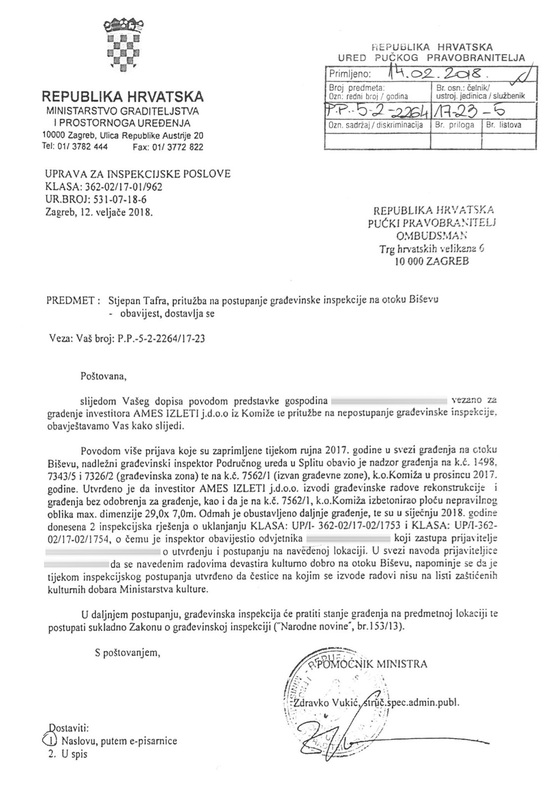 7343/5. The mentioned embankment is concrete. 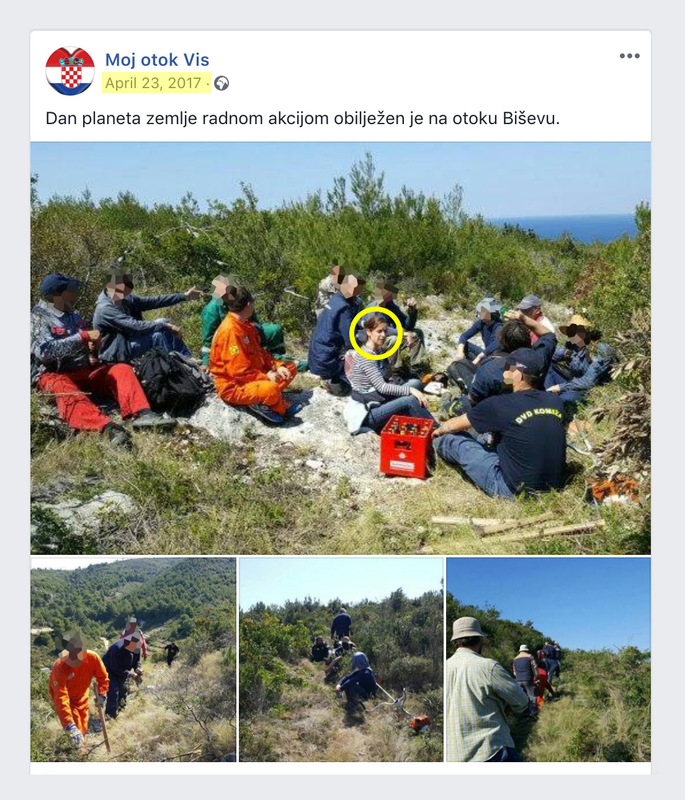 No archaeological or archaeological remains have been identified by the view of the visible earthen section of the relevant embankment except for a few fragments of ceramics . 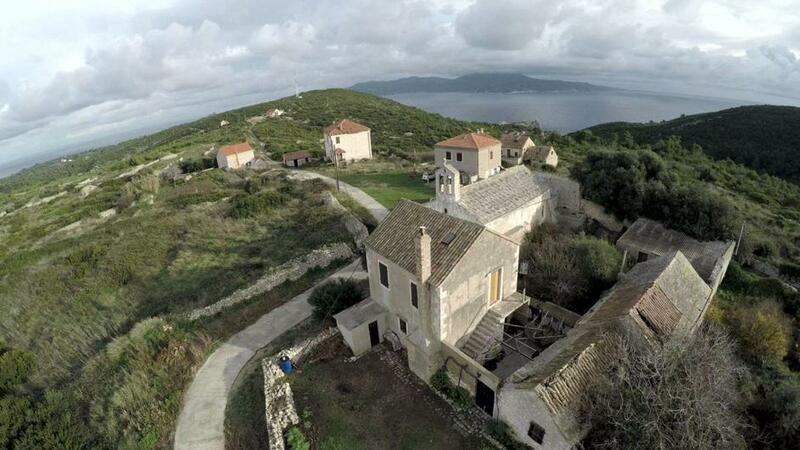 Plot 7562/1 (cca 1.500 m2 ) is fully owned by Mr. Nevena Karlovac who lives in California. 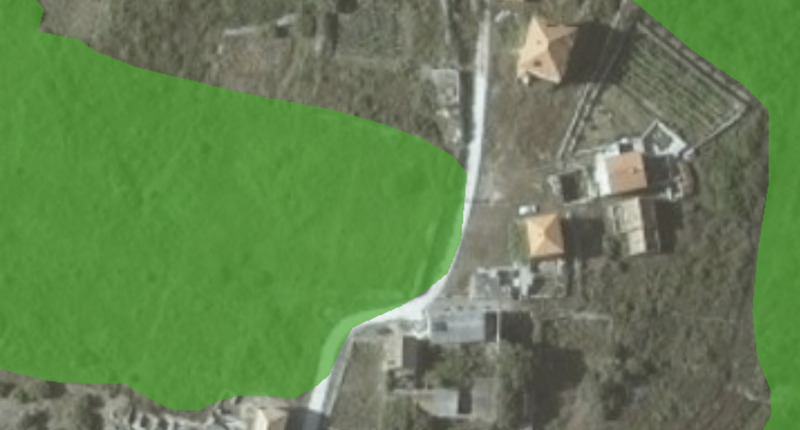 In the Natura 2000 network, this parcel is marked as a ” permanent lawn 2015 “. 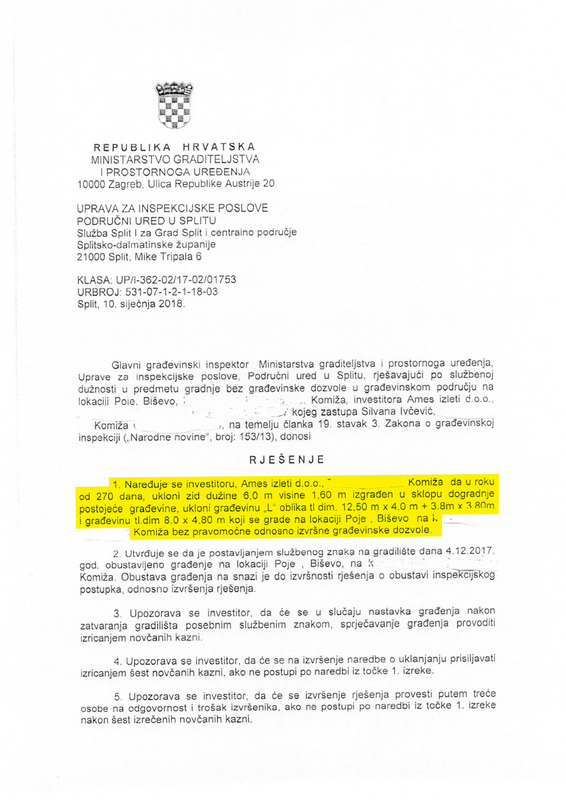 It should be noted that Ivčević, without the knowledge and consent of the owner, took possession of the mentioned particle, where he tamponized and cemented about 850 m2 . 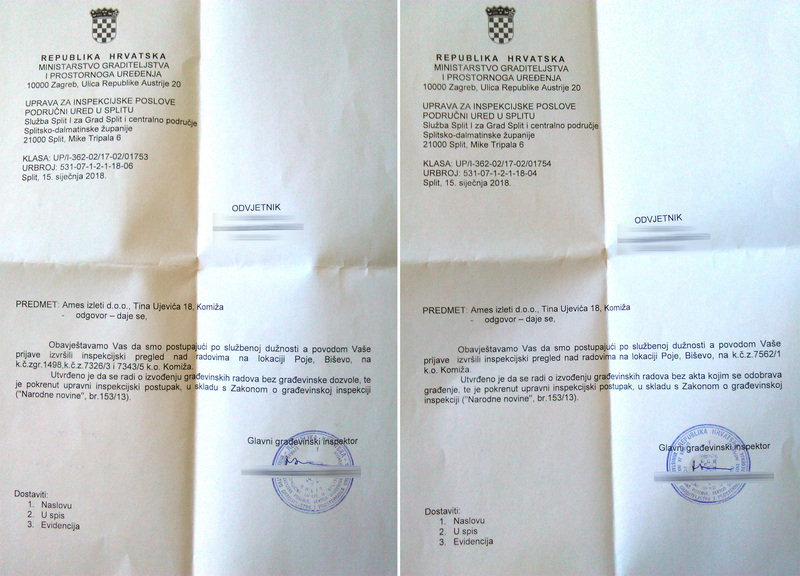 Due to these actions a separate judicial process has been initiated. 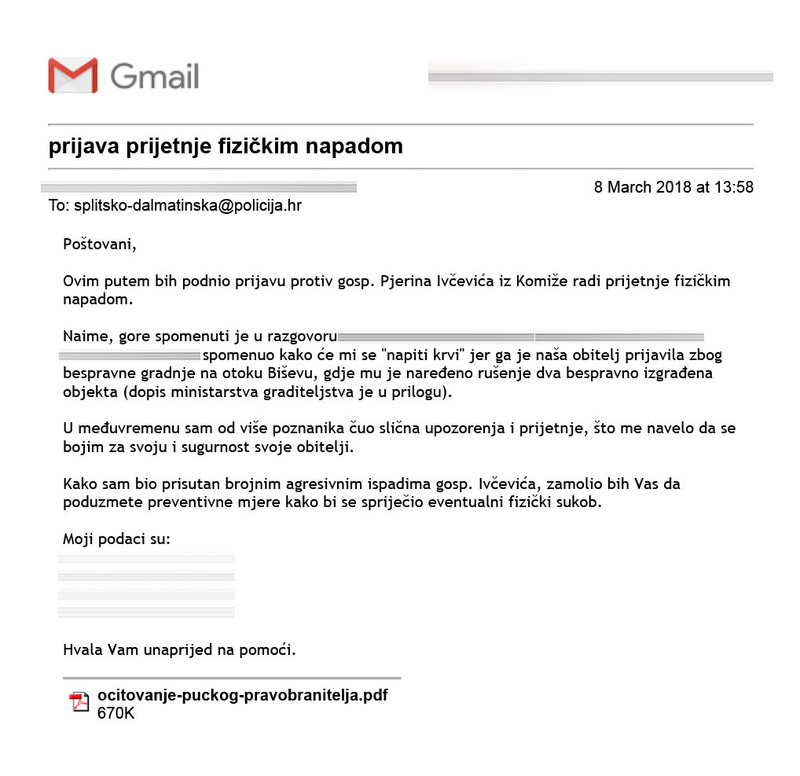 The city of Komiža, as a unit of local self-government, is not competent to conduct supervision of a building facility with the aim of establishing illegal construction . 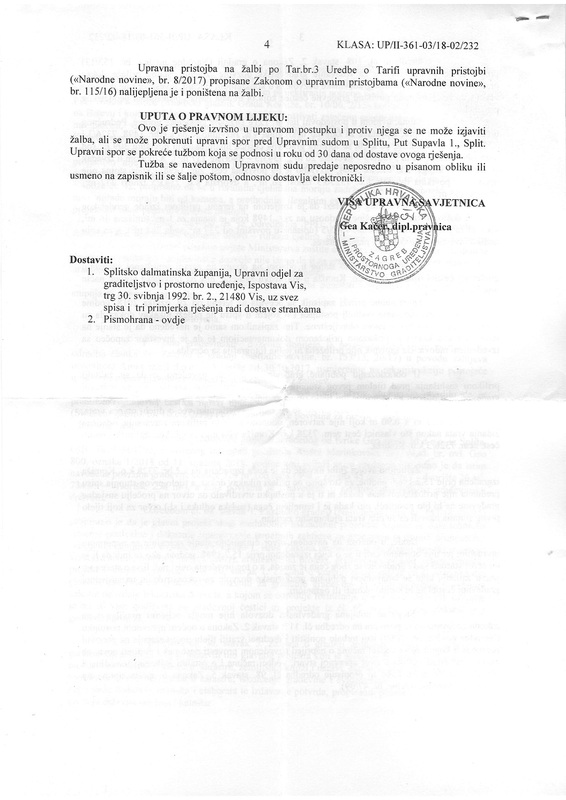 The eventual jurisdiction of the City of Komiza is stipulated by the provisions of the Civil Engineering Inspection Act (NN 153/13), which prescribes the procedures and powers of the municipal regulator in the implementation of supervision, while the competent body or construction inspectorate is responsible for determining the illegal construction. 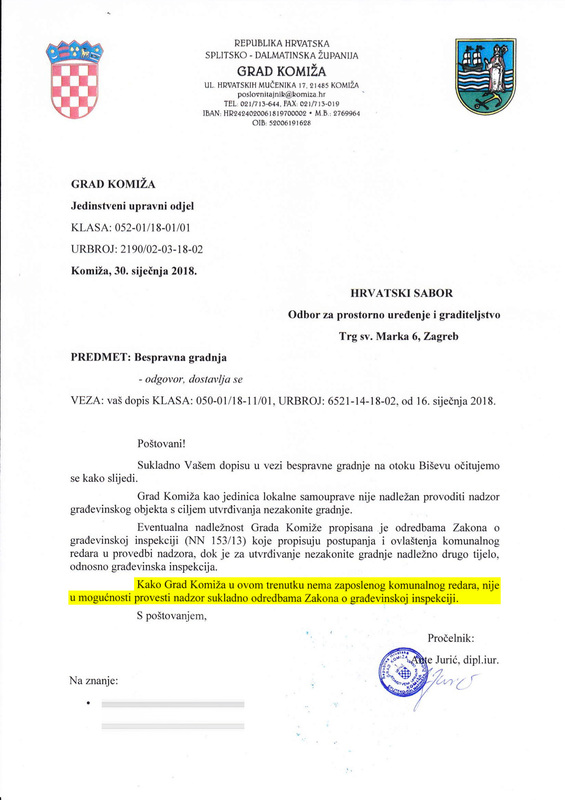 As Komiža Town currently does not have an employee communal line, it is not able to carry out supervision in accordance with the provisions of the Law on Construction Inspection . 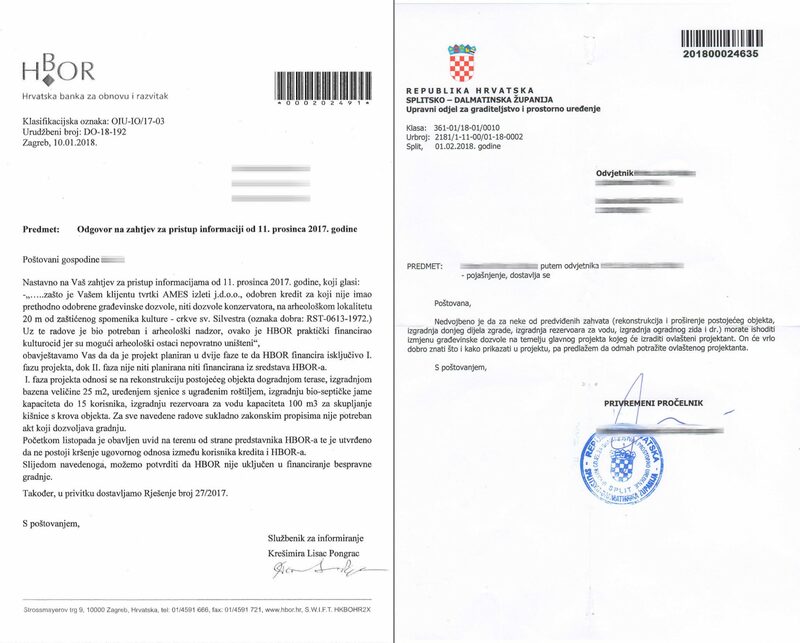 ” On the occasion of several applications received in September 2017 concerning construction on the island of Biševo, the competent construction inspector of the Regional Office in Split carried out construction supervision on cadastral plot no. 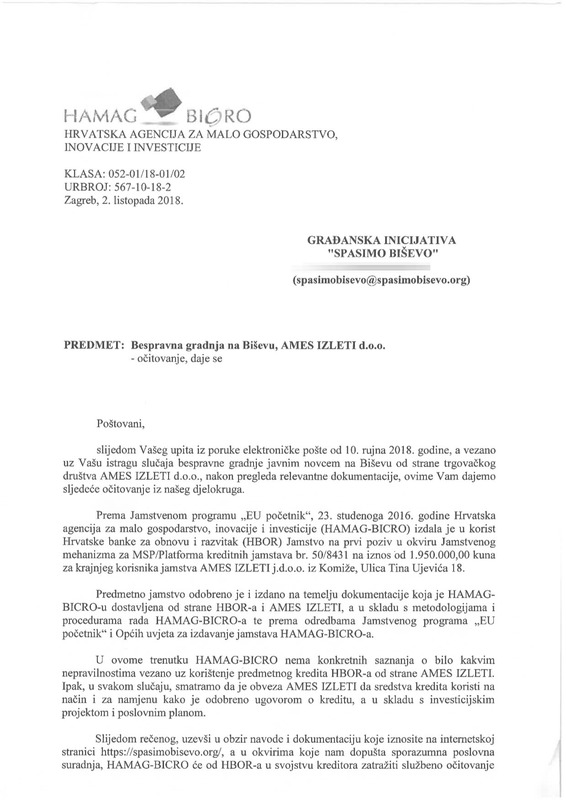 1498. 7343/5 and 7326/2 (building zone) and cp. 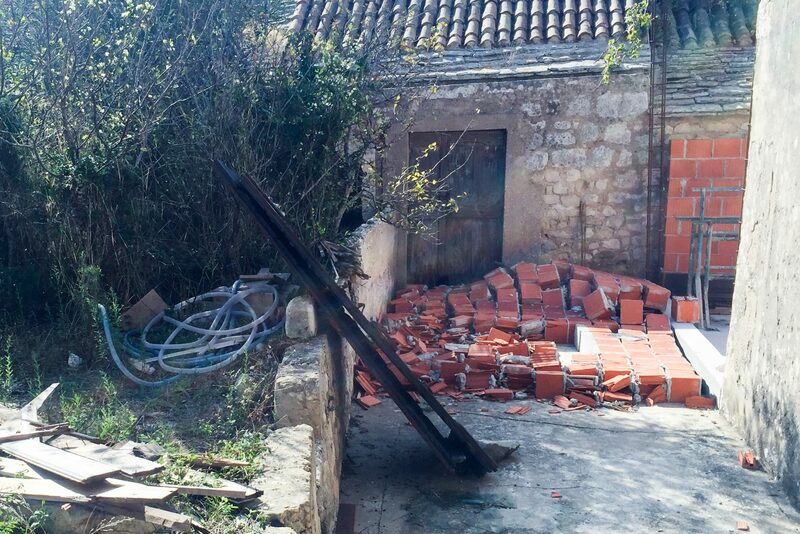 7562/1 (outside the building zone), Komiza in December 2017. 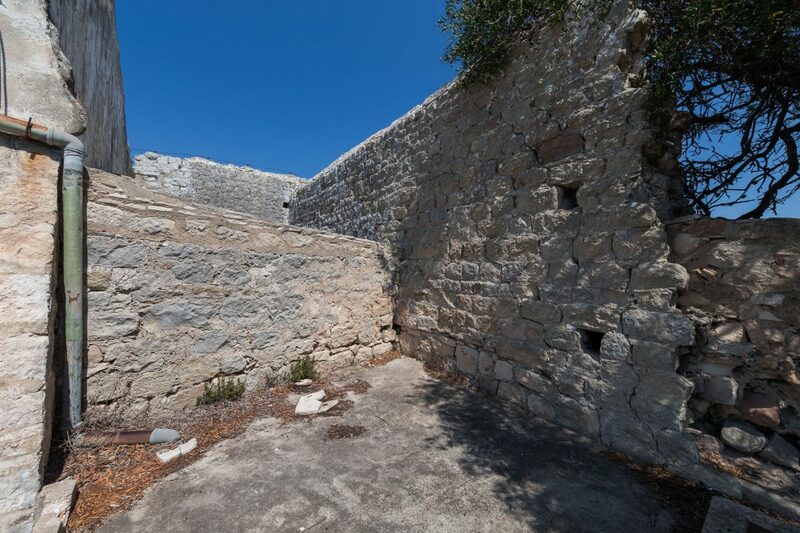 It was found that the investor AMES EXCURSIONS jdoo performs construction works of reconstruction and construction without permission for construction, as well as for c. 7562/1, the coCiosis avoided the irregular shape plate max. 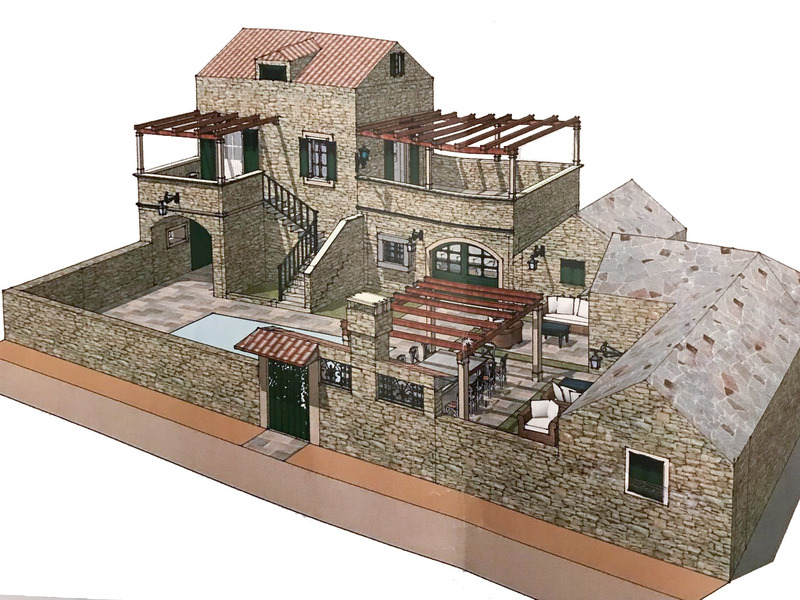 dimensions 29,0x 7,0m . Further construction was halted immediately, and in January 2018 two inspection decisions were taken to remove the CLASS: UP / I-362-02 / 17-02 / 1753 and CLASS: UP / I-362-02 / 17-02 / 1754 .